In late April 2012, I departed Moab, Utah, heading toward Hovenweep National Monument, 120 miles southeast. My first 89 miles were on U.S. Highway 191, transiting through Monticello and Blanding, Utah. Fifteen miles south of Blanding, my Magellan GPS directed me to turn east on Utah State Route 262. Although Magellan was on course, I was not. Blanding rests at 6000 feet in elevation. As you descent into the desert, each hill begins to look like the last one. Near the bottom of the third long hill, I approached the UT-262 East the turn-off. Making that turn with my travel trailer in tow required unusual discretion. Carrying a speed of 55 MPH over the top of the hill meant that I was doing 65 MPH near the bottom, and all without touching the throttle. I applied the brakes and downshifted out of overdrive. Friction creates heat. With my truck and trailer brakes engaged, I hoped that the brakes on my rig would not fade. With over five tons of metal accelerating downhill, I downshifted into third gear and let the engine roar. While applying my brakes, I dropped the shifter into Second and watched the engine rev up to 4200 RPM. 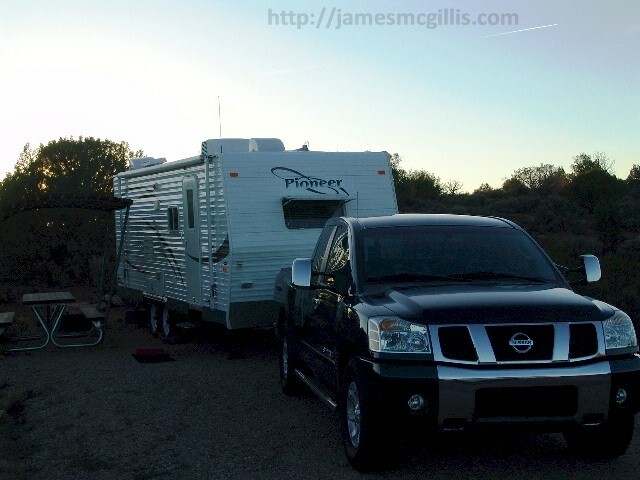 Having had the good sense to preset my trailer brakes for highway speeds, I felt them work in unison with the big disk brakes on my 2006 Nissan Titan. My rolling rocket ship responded in kind, slowing to about 45 MPH. The only problem was that I needed to be below 25 MPH in order to make the turn. At that point, it was “do or die”, so I applied the brakes even harder and hoped for the best. My “bail out” was to release the brakes and roll on past the intersection, but no one wants to hear Magellan say, “When possible, make a legal U-turn”. As I safely made the turn, the abundant skid marks and stray gravel on the road spoke to me. They said, “Jim, your successful outcome here and now is no cause for celebration”. When I found myself facing east on UT-262, I took a deep breath and then looked for a place to pull over. This was at least the third time I had traveled from Moab to Hovenweep National Monument. Unbelievably, this was my best job yet negotiating that crucial left turn. Please remember that your perception of time, distance and vertical motion are different in the High Southwest. As Jim Morrison so aptly sang, “Keep your eyes on the road and your hands upon the wheel”. Watch closely for the highway signs and keep your downhill speed below the posted speed limit. Otherwise, you too might miss your turn toward Hovenweep. Soon, Utah Hwy. 262 began to show its age. Almost from the start, there were almost no shoulders on the sides of the road. For the first nine miles, the road was narrow, harsh and unforgiving. At that point, Highway UT-262 turned to the south, leaving me on old Hovenweep Road, which is also designated Indian Route 5099. Although my Magellan GPS had performed flawlessly until that point, its digital mainspring was about to uncoil. Although Hovenweep National Monument is remote from any settlement larger than a trading post, it is a targeted destination for many motorists. With her database in full failure mode, Magellan’s siren-sweet voice tried to lead me astray. “Turn left at the next opportunity”, she declared. Such tactics may have lured Ulysses onto an ancient, rocky coastline, but not me. Her voice intended to deceive me. “Ha!” I said, “This is like déjà vu all over again”. This was my third trip to Hovenweep along this road. Had I learned anything? Slowly, my thoughts came back to me. Long ago, in Navajo land I had learned to disbelieve Magellan’s driving directions. Just try to drive from Gallup, New Mexico to Chaco Canyon with only Magellan as your guide. Twice in the past, Magellan had failed me there. Smugly, I concluded that no one at Magellan or its database creators had ever traveled these roads. If they had, they would not suggest a shortcut that starts at the washout of Montezuma Creek and then winds for miles over rough terrain. The first algorithmic rule for GPS databases should be, “If there is an alternative route over paved-roads, suggest it.” In order to do that, one must know firsthand if a road exists. If so, is paved or gravel? Only by placing the mapmakers’ eyes in the real world will such things ever change. Meanwhile, the Spirit of the Ancients sits around a celestial campfire, looking down at us and having a good laugh. Come on, mapmakers; none ever died wishing that they had spent more time in the office. After Magellan suggested a hard left turn up a steep and curving gravel road, I stopped to consult my trusty DeLorme Utah Atlas & Gazetteer. Later, while looking at Google Maps, I could see why Magellan got it wrong. From Hatch Trading Post to Hovenweep on paved roads requires a roundabout tour to the south, via Reservation Road 2416 and San Juan County Road 413. Just south of Hatch Trading Post, that paved route crosses Montezuma Creek on a contemporary highway bridge. Just south of that bridge is where Magellan suggested a make a hard left turn. 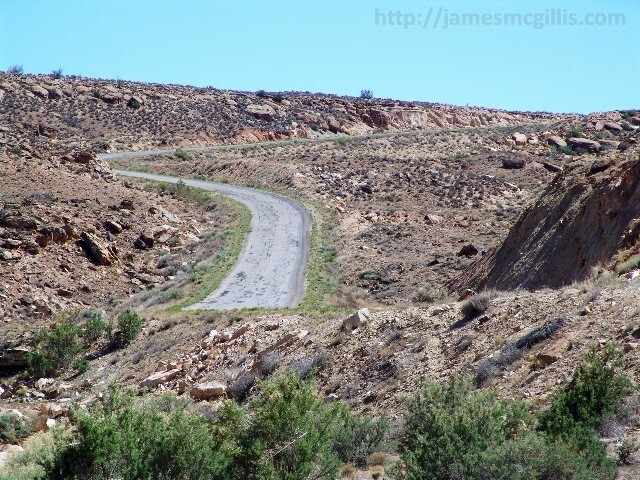 Had I taken that route, it would have soon connected me with a graveled extension of “Hovenweep Road”, also called San Juan County Road 212. If one follows that gravel road, it is indeed the original and shorter route to Hovenweep National Monument. With its “Hovenweep Road” moniker, that gravel route is only ten miles long, but takes thirty-eight minutes. The paved route to the south is longer, but takes only twenty-nine minutes. If you are familiar with Google Street View, you know that Google camera cars have traversed almost every paved road in America. Magellan, for its part, has outsourced its database to either the incompetent or the knowledgeable. The Navajo Nation is the largest Native American tribe in the U.S. Although their reservation abuts the Four Corners on three sides, Magellan treats it like a no-man’s land. Rich with cultural heritage, it behooves Magellan to provide accurate directions throughout the region. Magellan’s users need to know that they can follow paved roads to such treasures as Hovenweep National Monument. 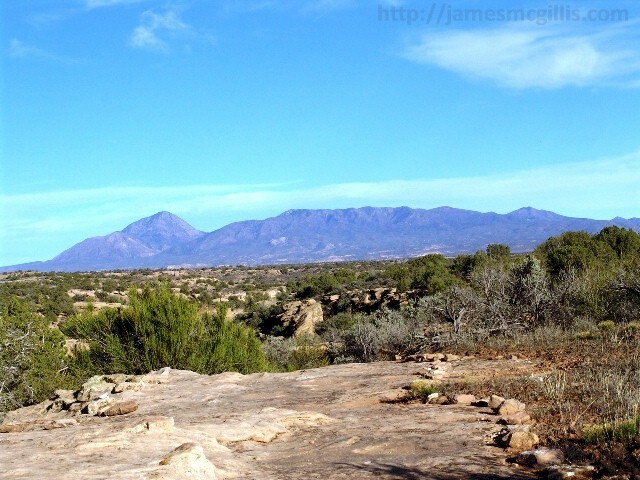 Once I got past the Magellan database errors, I had a pleasant ride to Hovenweep. To the sides of the road I saw occasional Navajo dwellings. Whether any one of them was occupied or abandoned, I could not say. Were these empty houses awaiting their owner’s return or were they the abandoned relics of a time before the Dine’ (Navajo) moved to the cities. 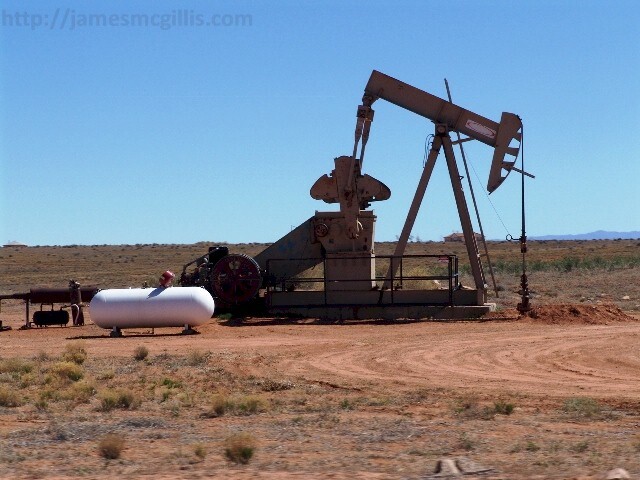 Other major features on the land consisted of natural gas wells and occasional water wells. 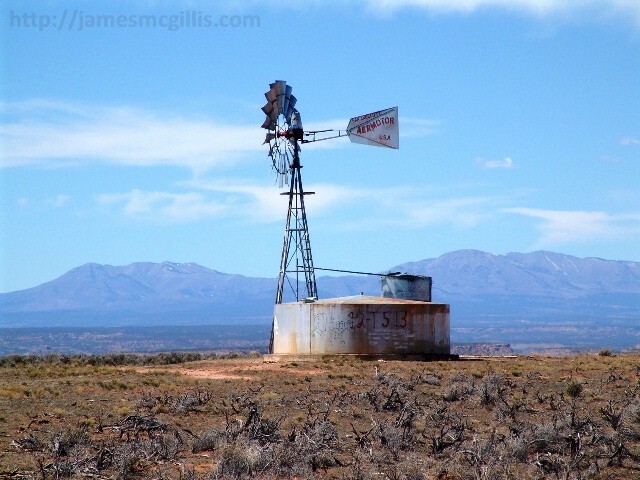 The gas wells utilized propane fuel to spin their flywheels, while the water wells featured Aermotor windmill pumps. Although windmills usually indicate that cattle will be grazing nearby, the only wildlife in view that day consisted of wild horses. Even in April, the desert was extremely dry. Little water ran in the major watercourses and there were no waterholes visible on the mesa. 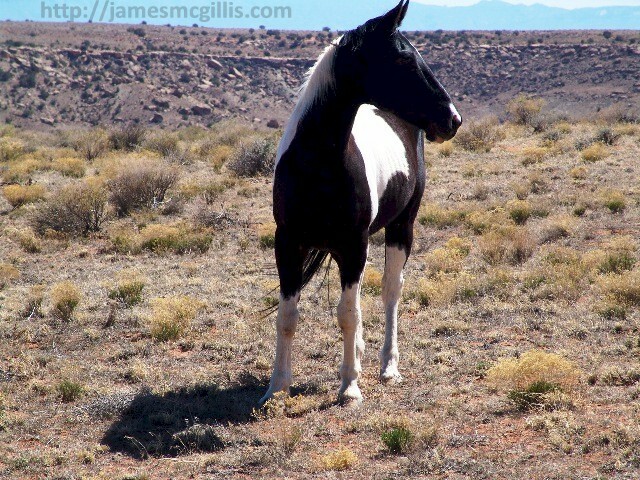 For the wild horses, finding sufficient forage and water defines their constant battle for life over death. Few of the horses looked well fed or well watered. 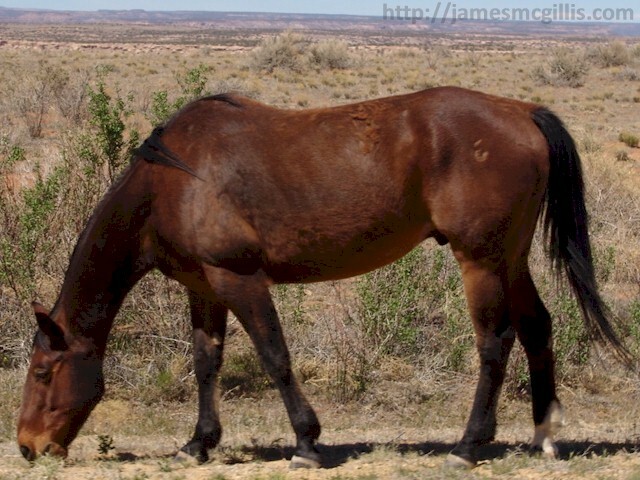 In order to conserve energy or to beg a meal, many untamed horses stay close to the road. Although they were clearly wild, most of the horses barely moved when I stopped to photograph them. One exception that day was a palomino stallion that I startled as he crossed the landscape. In order to photograph the horse, I had to make a U-turn and then stop on the gravel apron of a desolate crossroad. With all of the noise and commotion that I had caused, the palomino caught wind of me. As he galloped across an arroyo, I had time to capture only one image of the horse. As I later zoomed in on that image, I realized that his ribs were showing, indicating severe environmental stress. If I could rewind and redo my actions that day, I would not have pursued and further stressed that beautiful animal with my vehicle or on foot. As I approached Little Ruin Canyon at Hovenweep National Monument, the grand Sleeping Ute Mountain appeared to the east. Although many of the place names throughout the High Southwest are fanciful in their origins, Sleeping Ute Mountain lives up to its name. With his head in the north and his feet in the south, the ancient spirit of the mountain appears to be at rest. As I approached the campground at Hovenweep National Monument near sundown, I held my breath, hoping to find an open campsite large enough to accommodate my rig.